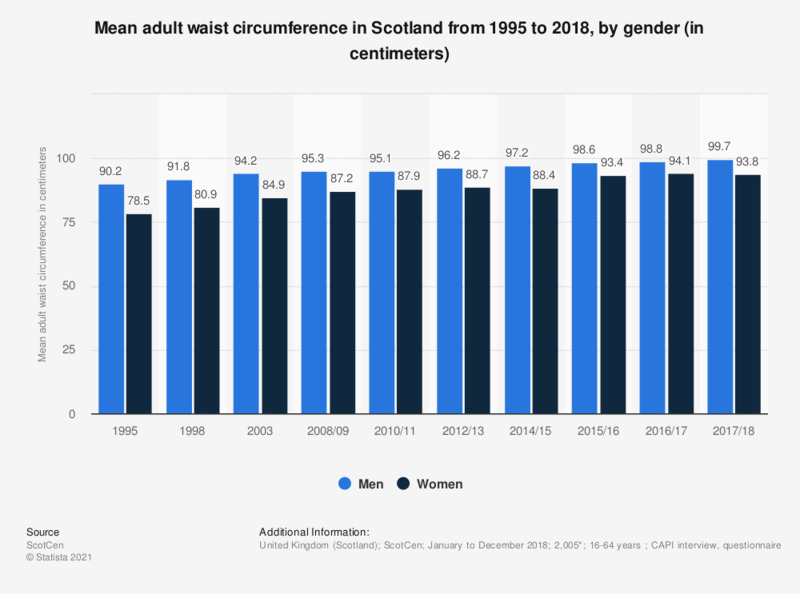 This statistic displays the mean waist circumference of individuals in Scotland from 1995 to 2017, by gender. In the year 2016/17, men had a waist circumference of 98.8 centimeters and women had a waist circumference of 94.1 centimeters. * Weighted bases: n (1995)=6,755, n (1998)=6,390, n (2003)=4,176, n (2008/09)=1,763, n (2010/11)=1,572, n (2012/13)=1,703, n (2014/15)=1,659, n(2015/16)=1,778. A raised waist circumference is more than 102 centimeters for men and more than 88 centimeters for women. These are equivalent to 102.75 centimeters and 91.35 centimeters using the interviewer measures.